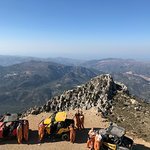 Some of Crete’s most stark and startling landscapes are not accessible from the road—so if you’re an adrenaline junkie, off-road is the way to go. 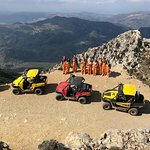 Zoom past lakes and dams, up mountains and through olive groves, along blacktop roads and across dry river beds on this Hersonissos off-road buggy tour. Tour includes round-trip transfers, full instruction, and a classic taverna lunch. After pickup from your Hersonissos hotel or the port, listen to a quick safety briefing and driving instructions before you set off following your guide. 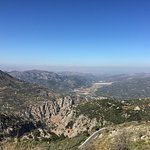 Pass through Old Heraklion, say goodbye to the road, and head up toward the Lasithi Plateau, a fertile volcanic plain surrounded by the Dikti Mountains. 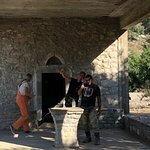 Pause at Kera Kardiotissa Monastery, an ancient Eastern Orthodox monastery; the Havgas Lakes that provide water to the Lasithi Plateau; and the village of Psychro, where you’ll enjoy an authentic taverna lunch. From here, follow a scenic mountain road through the village of Kastamonitsa back to Hersonissos. Your guide will drop you back to your hotel or port. 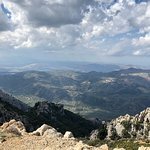 Fun Adventure and Great Way to see Beautiful Crete! 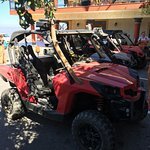 Get quick answers from Off-Road Buggy Adventure in Crete staff and past visitors.